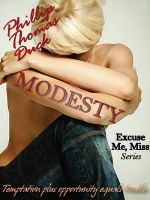 The second book in Phillip Thomas Duck’s Excuse Me, Miss series follows Terri Welker who photographs philandering men in the act for James Boston Investigations. One day she finds out that the man who raped her several years ago is dead and the life and the man she left behind on that terrible day have come back to haunt her. Mr. Duck’s continues his interesting short fiction series in the world of infidelity and suspense. Another strong, but vulnerable woman with past secrets. Thank you to Mr. Duck for giving me the opportunity to review his book.